Villa Clessidra is a three-level house, a masterpiece born as a concept in the mind of a creative architect Laertes – Antonios Ando Vassiliou. As a co-founder of OPA, he participated in creating Cliffside Casa Brutale. 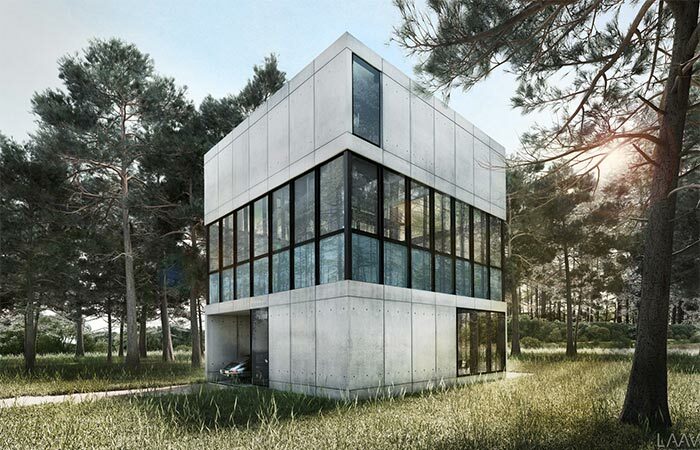 Villa Clessidra is his new project that comes in a cubic shape. The 200 square meters placed in the middle of a Dutch pine forest are intended for rest and relaxation. Also, it’s well designed and provides everything for everyday necessities. The scheme is assembled from foam-board molded panels that are made of concrete fixed on a steel frame. 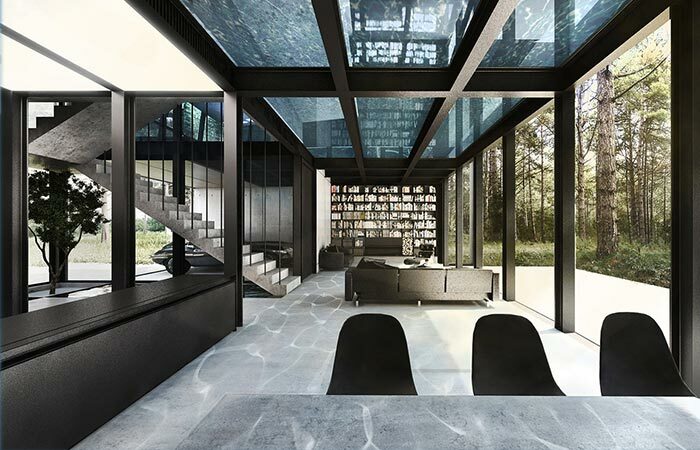 This is a three level house with 200 square meters, located in a Dutch forest. Between the ground level and the top floor, there is a swimming pool which purpose is to encourage owners to swim more often. The same floor has a mirrored ceilings and it’s not transparent. This makes the third floor much more isolated and more of a private zone. On the top floor, there are two bedrooms, both with bathrooms. The bottom floor is where the communal areas are. 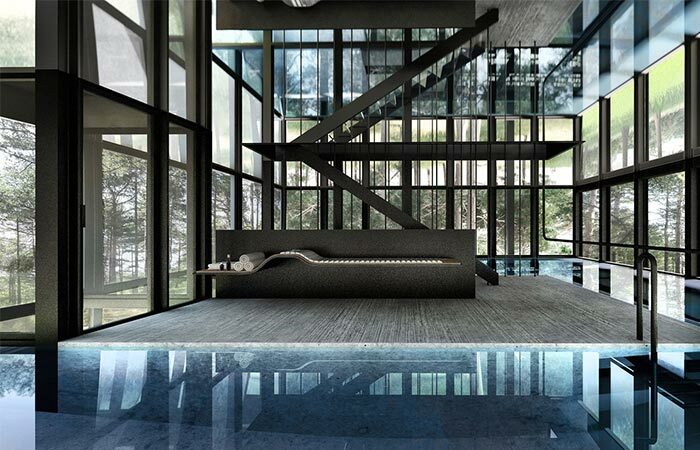 The main bedroom has a visual contact and access to the swimming pool. The first floor is intended for social, kitchen and other regular activities. The south-faced facade is made of glass, so the calming feeling of merging with nature is strong, especially when natural light plays its games with water and mirror reflections. The entire glass wall is completely retractable. 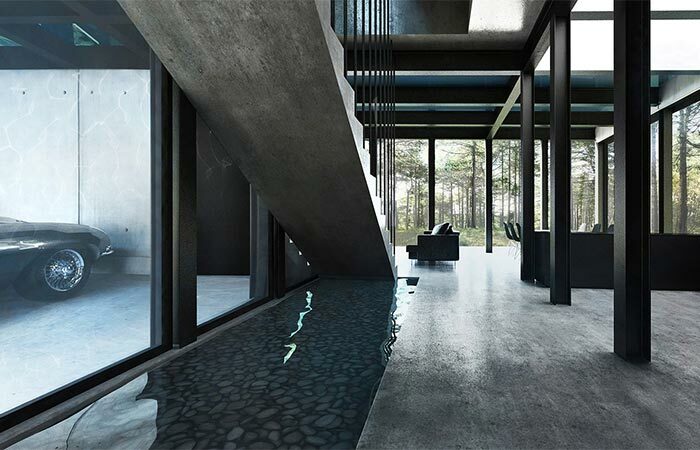 The second floor features a big swimming pool. Glass walls are there to connect the residents with the surrounding nature. 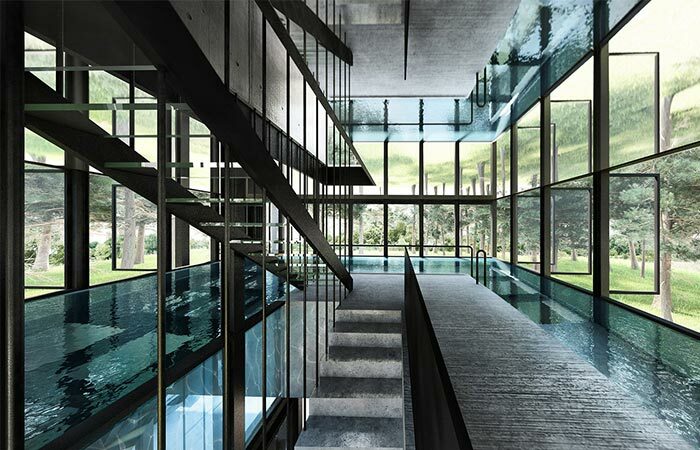 Central stairs are connecting all three floors, passing through a pool which is glass-encased. Outside, there is a well-protected parking space built into an almost perfect cubic shape. No doubt that the feeling of being outside, inside, at home, upstairs, and in a forest at the same time would be awesome.